here are my favorites this week with a sweet sewing theme. don't forget to link up if you have a favorites post from the week! 1. 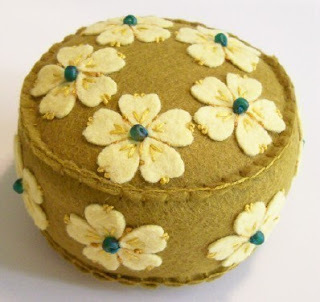 This cute pincushion from the daily pincushion! I've bought some really pretty felt from this shop & loved using all the fun colors offered. The work on these pincushions is so detailed & gorgeous! 2. t-shirts for wearing has some really great tees in their shop. 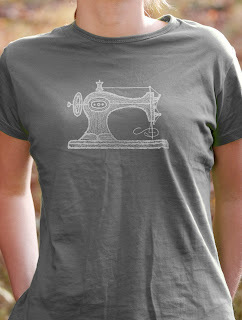 There are several sewing themed ones, but this sewing machine tee is my absolute favorite. It's pretty great, don't ya think? Well, it gets even better: they're organic cotton! 3. I have a necklace obsession. Some girls like shoes, i like necklaces ((and shoes)). 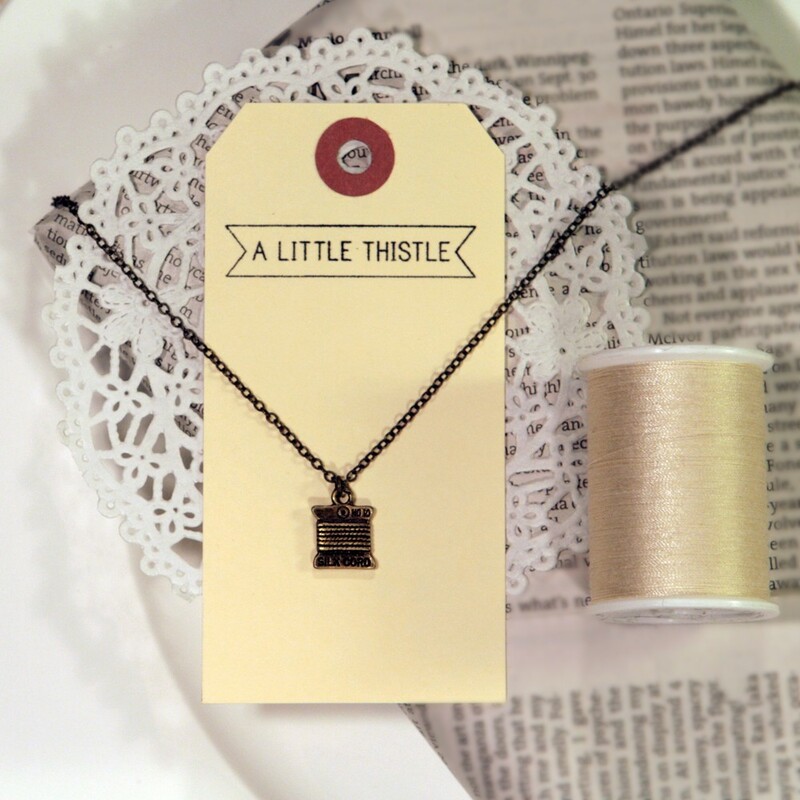 This cute little thread spool necklace from a little thistle is absolutely perfect...and only $12?! Jackpot. 4. Fun stationery is so great to have on hand AND to receive in the mail. 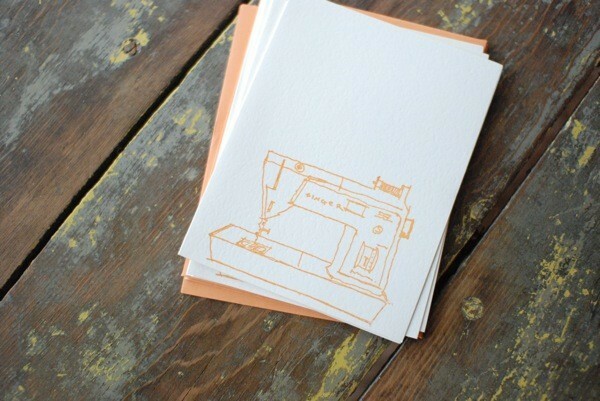 I would love a pack of these sewing machine cards from paper & twine in every color imaginable. all of these items would be GREAT gifts for your favorite crafter, designer, and/or seamstress. I'm loving' that t-shirt! So cute. and The necklace and note cards are TOO cute!!!! too cute! love the tee and the necklace. hmmm, might have to grab those. ive had a hankering to buy myself something from etsy for a change. Oh boy, Kim! As if my wishlist wasn't long enough already... :) Love the sewing theme! Kim! I love your selection of favorites this week. I am especially loving the pin cushion. So dainty! That pin cushion is ADORABLE, and my mom, who is a design, would love those sewing machine cards! Love the spool necklace! Adorable!! that pincushion is beautiful. i may have to buy some felt from her - such a gorgeous color selection! have a great weekend kim! Oh, thanks for sharing! I LOVE that pincushion and the sewing machine tee and stationery. that pincushion is oh sooo cute!! love it! would love to have something other then my standard store bought tomato! I love that pin cushion! It is so sweet. 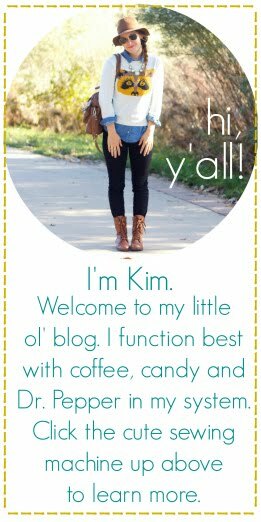 I just found your blog and really love it! Can't wait to read all your posts!! Yes to the t-shirt! 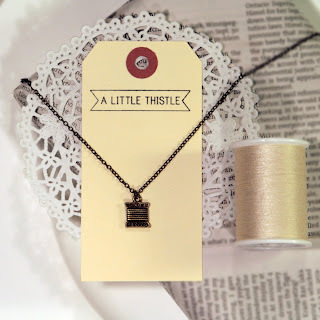 But not without the spool necklace :) Great list of favs! These posts are going to break my wallet! hehe. But that's okay. :) I LOVE that pin cushion! I don't sew, but I want to learn. And once I do I think I will need a beautiful pin cushion! Adding that to my favourites, for sure! And I love that t-shirt, I'm going to check out the rest of their selection! And I loooooooove Kyla Roma, such a sweet girl and she's so talented! And stationery is one of my absolute favourite things! That pincushion is a work of art! Wowie!